For my daughter's 4th birthday, I decided to make a few changes. When looking back on her birthdays, she is always enamored with her cakes and little else. With this in mind, I decided to focus my energy on her birthday cake and to keep everything else super simple. In the past, I have made the whole meal myself, baked and decorated the cake and decorated my home in whatever theme that we had chosen. It was a lot of work and it also cost money. It was all very nice but I wasn't really enjoying her birthday parties because I was running around so much. We have little Miss. Em this year who is 4 months old and I knew that I wouldn't be able to do all the things that I had done in the past. I decided that I would order the supper for the family party (2 for 1 pizzas), not worry about the decorations and focus solely on the cakes. We did a party in the early morning for her friends and friend's parents and then we hosted family in the evening. 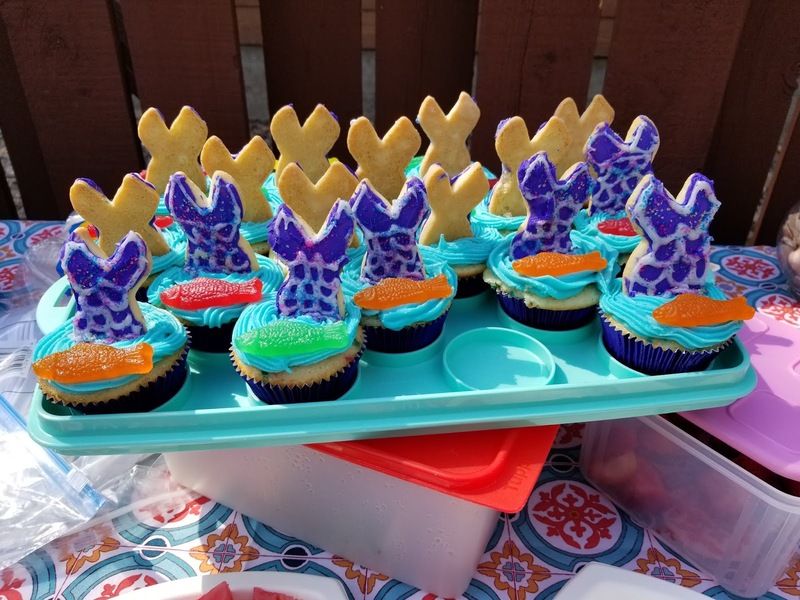 My amazing Mom baked sugar cookie mermaid tails for me to help me decorate my daughter's cakes. I did cupcakes for the kid party and cake for the family party. I had looked into buying a fruit tray for the kid's party but it was far too expensive for my tastes. I just bought a watermelon, strawberries, raspberries and blueberries and prepped them myself. This took minimal time. I made cupcakes for the party and that was all there was for food. Cake and fruit. I had a cooler stocked with water and juice boxes for the kids and parents to drink. I put a table cloth that I already owned on the table along with some borrowed seashells and called the decor good. I had planned a few easy games for the kids in case they were bored, but we didn't end up using them because they were playing so well! 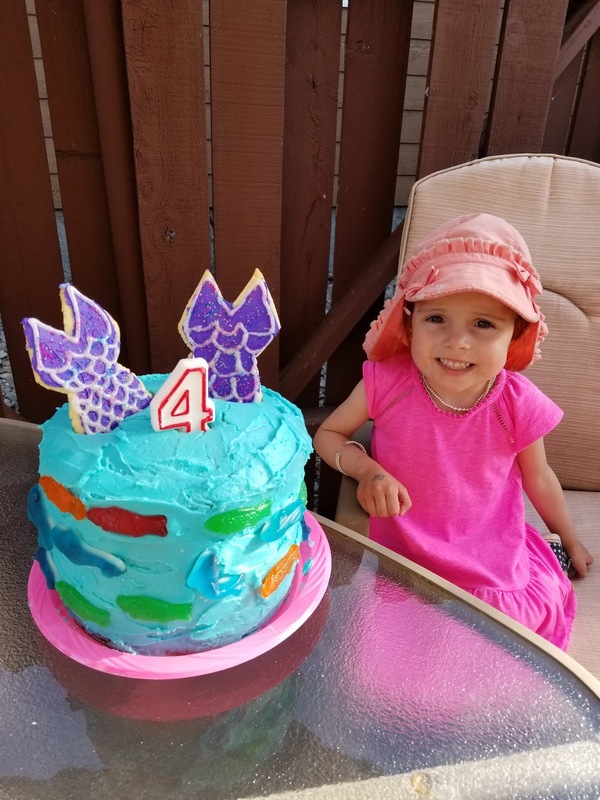 I worked on the cakes throughout the week during my youngest daughter's naps. 4 days before the parties I baked and froze the cakes. 3 days before the parties I iced the cookies and froze them. 2 days before the party I made the icing. The day before the party I iced and decorated the cakes and then stuck them back in the freezer. We don't have air conditioning and I was afraid that all the icing would melt off! The sugar cookies were added at the very last minute so that they didn't fall apart before the party. The only 'crafty' (I use this word loosely here) thing that I did for the birthday party was create a mermaid photo booth for the kids. It took me all of 15 minutes to create and it cost $2 for the bristol board. It was super easy and the kids liked 'becoming' mermaids. The family party was kept super simple, as well. I ordered pizza for our main meal. I set out chips and watermelon and had the cooler stocked with juice boxes, water and pop. My daughter was thrilled with her parties. 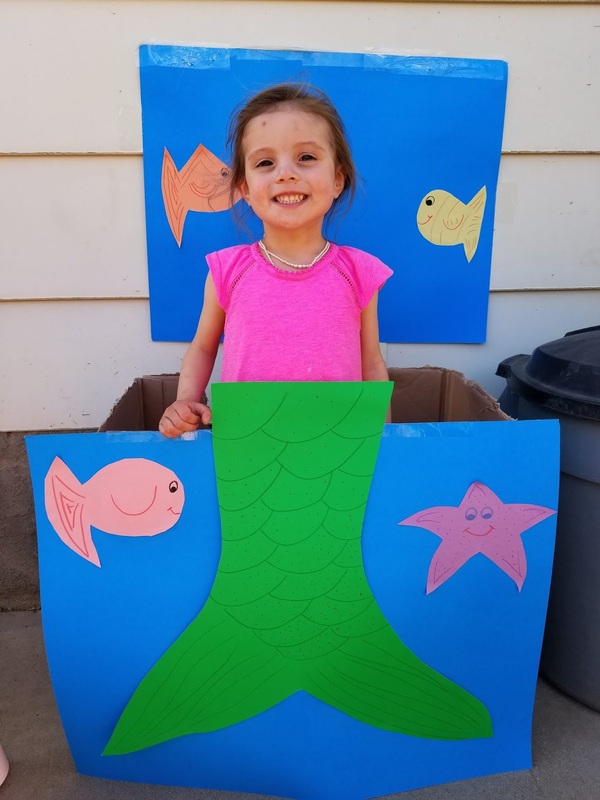 She got to run and play with her friends, eat cake and become a mermaid. She had so much fun. It was a good lesson for me that I don't have to throw "Pinterest-worthy" parties in order for my daughter to have a good day. Going forth, I will definitely focus my efforts where they count and not worry so much about the rest. I will be sticking to simple birthdays from now on. That's a great idea, just focusing on your daughter's favorite part of her parties! That makes it so much easier on you, and she still has a great time. The cake and cupcakes are super cute!! Thank you so much, Jess! It really makes life easier!